This is the basal bird Jeholornis from the Jehol Group of early Cretaceous of China (of the Jiufotang formation, around 120 million years ago). 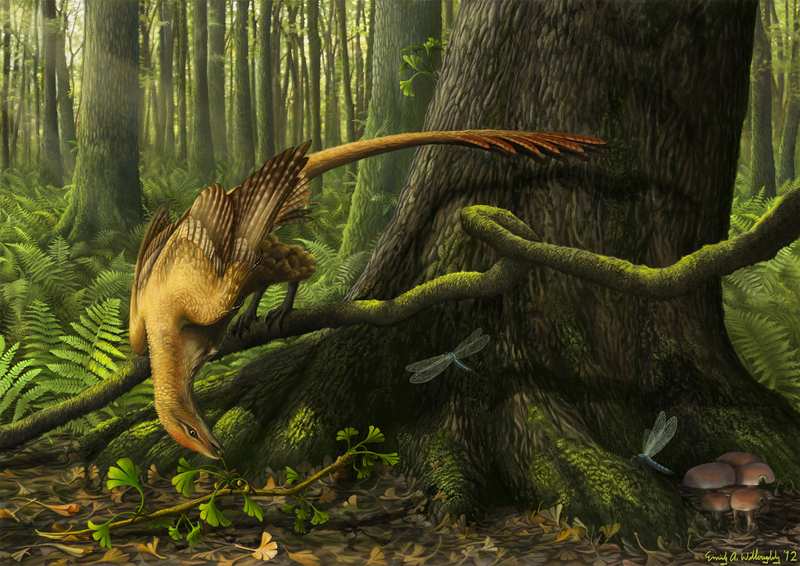 This species is meant to represent the original J. prima, though the tail fronds are based on the well-preserved tail of J. palmapenis, which may not be a distinct species. 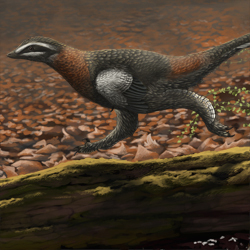 Jeholornis was fairly similar in anatomy to the more well-known Archaeopteryx, but differs in being decidedly more "birdlike" in several respects. 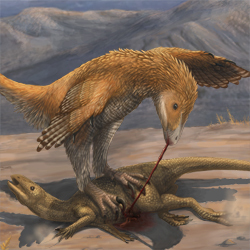 It had very few teeth, more well-developed shoulder girdles, longer forelimbs, and claw morphology that indicates perching ability. The hallux may or may not be reversed, and more likely than not is representative of a state of partial reversal. The type fossil of J. prima is interesting in that it preserved a collection of fossilized seeds in crop area. It is unknown what plant they belonged to, but here I've reconstructed it eating the seeds of a fallen branch of the Ginkgo tree, which it very likely would have done. The morphology of the mandible, dentaries and teeth indicate that Jeholorniswas well-adapted for feeding on seeds. The seed-eating lifestyle would allow more carotenoids to be present in the animal's diet than would a stricter carnivorous lifestyle, so I've taken some liberties here in giving it some slightly brighter colors on the head and tailfan, which was likely used for display. It is depicted alongside the Jehol dragonfly Aeschnidium.